Richard Asare joined IITA in 2006 as the Regional Cocoa Agroforester in the defunct Sustainable Tree Crops Program (STCP) in Ghana. Prior to that he worked as an Agricultural Advisor with the Danida Forest Seed Center (DFSC), Center for Forest, Landscape and Planning (FLD) all in Denmark and as a consultant for the World Cocoa Foundation (WFC), 2001–2006. His in-depth knowledge on integrated tree crops systems coupled with his practical field experience in tree management on farmlands strengthens his expertise on sustainable agricultural land-use practice. For the past eleven years he has been involved in research studies across East, West, and Central Africa looking into agroforestry tree seed distribution pathways and researching on forest trees that are preferred by farmers and recommended by researchers as compatible with cocoa. He has worked closely and trained stakeholders in tree crops farming in the humid tropics of Africa, particularly Cameroon, Côte d’Ivoire, Ghana, Liberia, and Nigeria to develop a comprehensive framework that packages tree diversification options on cocoa farms in a way that improves, encourages, and promotes local knowledge according to environmental conditions, farmer tree species preferences, market demands, and improved planting material availability. 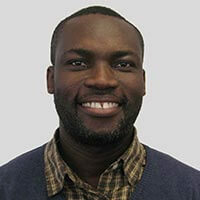 This work culminated into his PhD research which focuses on the resilience of cocoa agroforests to impacts of climate change: looking at the relationships between on-farm shade diversity, climate variables, and cocoa production. This is a collaboration between Copenhagen University and IITA. He has a B.Sc. in Agricultural Science (soil science) and a diploma in education from the University of Cape Coast, Ghana. He also holds an M.Sc. in Agronomy/Land-use in Developing Countries from Copenhagen University (KVL) and a certificate in project management from Carl Bro International Denmark.